In this course we will review erythema mutiforme in detail. Join us! 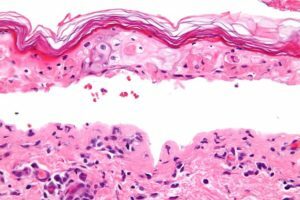 Erythema multiforme (EM) is a type of cytotoxic dermatitis, which can be triggered by many factors; mainly herpes simplex infection and drugs being the implicating factors. Although it is self-limiting, recurrences are common. 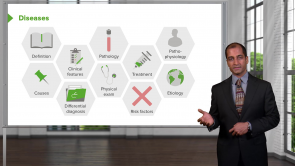 In this article, definition, epidemiology, aetiology, pathology, pathophysiology, symptoms, diagnosis, differential diagnosis, therapy, prognosis and progression of EM will be discussed. Stevens-Johnson syndrome is an immune-complex mediated hypersensitivity reaction that can be triggered by infectious etiologies or the use of anticonvulsants, antibiotics or any other drug. 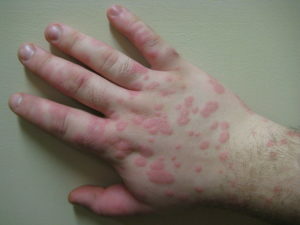 The condition is characterized by epidermal necrolysis, separation of the epidermis from the dermis, and the formation of skin blisters and bullae over the face, lips, throat and upper or lower extremities. Patients usually have severe electrolyte disturbances due to excessive fluid loss. Management is largely supportive. the lecture was easy to understand and well done. i am feeling satisfied after listening to this lecture.